Posted October 20th, 2016 by Judith Clemo & filed under beach, cornish holidays, cornwall, cottages, family friendly, St Austell, tregongeeves farm cottages. Sometimes, life passes us by with emails, Facebook updates, text messages and the constant buzz of modern life. It is easy to forget the little things that made us giggle as children. The things that make us laugh as adults. Luckily Cornwall has the odd mobile black hole and you can get cut off and go back to how things used to be in our good old days. This week, my heart melted listening to our youngest jumping into puddles at full pelt. The fact she had her brand her red leather boots on was an issue I soon forgot as she begged me to join in too. I had forgotten how much fun jumping, getting soaking wet and muddy can be. It cost us nothing, but I bet we both remember it for a while. 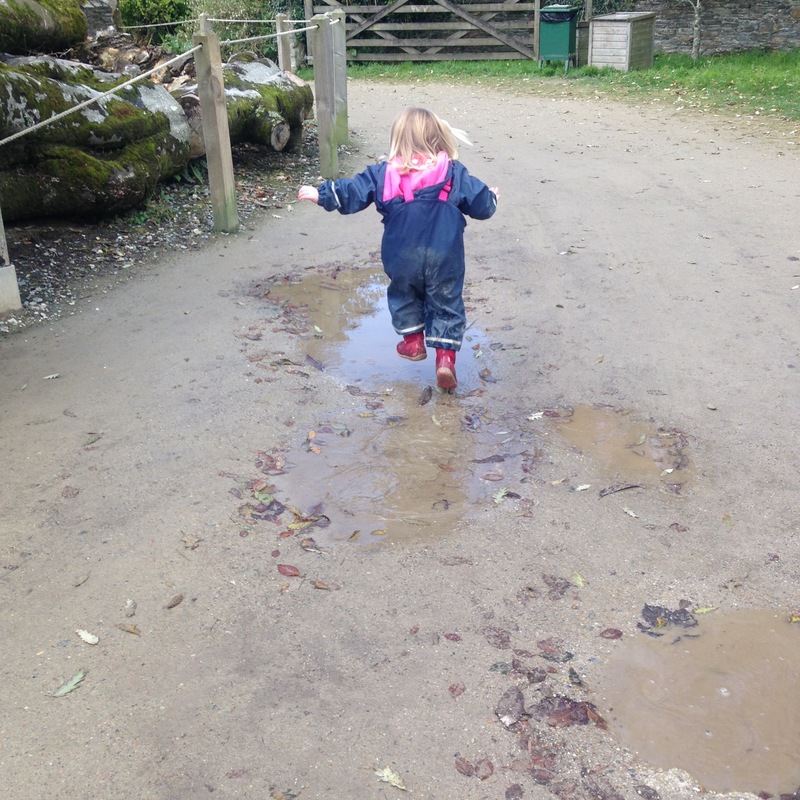 So go one, I dare you to come to Cornwall and find the biggest, muddiest puddle you can have a splashing good time – like we used to in the good old days. Despite having puddles big enough to jump in, it has only rained one night, the rest of the time we have been spoilt with glorious autumnal sun – we love it. Judith has been busy making the most of the sun out on the beach collecting driftwood. She is determined to make Driftwood Christmas trees for the cottage this year having gone on a course to make them last year. The animals are bracing themselves for the winter months and the endless mud that seems to arrive from mid winter time. But Alice the Shetland is looking splendid at the moment, after a good brush and the new ‘Curly sheep’ (still yet to be named) have settled in well. Judith keeps trying to lure us all to Tregongeeves for a ‘family meal’, the real reason is she wants us to help heard the untamed sheep into a new paddock…we have managed to avoid doing this so far as I think it could be a tricky job! The Lost Gardens of Heligan – as the days get shorter, the leaves get browner and the garden gets quieter it becomes even more magical than usual. The Eden Project – the gardens and biomes maintain their spectacular beauty but there is the added attraction of the ice skating rink from half term onwards. Look out for special toddler sessions – we love these. Trebah – how have we only just discovered this amazing, special garden. As my friend said it is a bit like being in ‘Honey I shrunk the Kids’ as the magical lay out is enchanting for young and old. The gardens are not great for pushchairs or wheelchairs, but the cafe is amazing. Lanhydrock – a National Trust gem. Visit the house all make the most of the large sprawling grounds. You can even walk the short walk up to the Bodmin Parkway Station for those train mad youngsters – time it right and the steam train will come past. Pinetum – right in the heart of St Austell this secluded garden is a well kept secret. It is not huge, but not small, just the right size for the shorter winter days and the cafe does lovely warming food too.